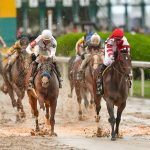 Saturday was a big day on the road to the Kentucky Derby, as both divisions of the Rebel Stakes ended in dramatic fashion. 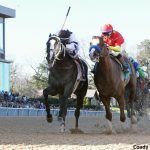 In each race at Oaklawn Racing and Gaming, a less-than-even-money favorite was edged out at the wire. In the first division, Improbable went off at 2-5 odds and appeared to survive two wide turns as he took the lead down the stretch. 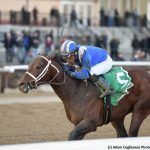 However, 8-1 shot Long Range Toddy rallied from fourth place in the final furlong to give the Bob Baffert-trained colt his first loss in four races. An hour later, another Baffert horse — Game Winner — went off as a 1-2 favorite. He and Omaha Beach separated themselves from the pack once they hit the stretch, with the Richard Mandella-trained colt leading by a couple of lengths before Game Winner made a late charge. The photo finish showed the 4-1 selection, making his stakes race debut, beating last year’s Breeders’ Cup Juvenile by a neck. Both Long Range Toddy and Omaha Beach earned 37.5 points for their wins and likely secured their spots in the May 4 Kentucky Derby. Game Winner, who earned 15 points on Saturday, likely solidified his standing after winning 30 points last fall. A week ago, Long Rage Toddy and Omaha Beach were considered longshots among the field of Derby contenders. However, their performances against the two horses who had been seen as the top selections in most futures pools have caused their odds to drop. Last week, Sportsbook.ag was offering Omaha Beach, who had only won once in his first five races, at 30-1. By Sunday, the colt’s odds were listed at 8-1, making him the book’s sixth choice. At William Hill’s U.S. books, his odds went from 40-1 to 16-1 on Sunday. Long Range Toddy — a horse who had fared well previously at Oaklawn — fetched 75-1 odds last week at Sportsbook.ag. Now, it’s down to 15-1 as of Sunday. Over at William Hill, he also dropped from 75-1 to 24-1. 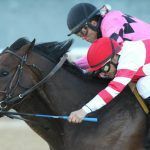 Even though both are almost assuredly in the field, the connections to the two horses have said they’re expected to run in one more prep race before moving to Churchill Downs for the first leg in the Triple Crown. 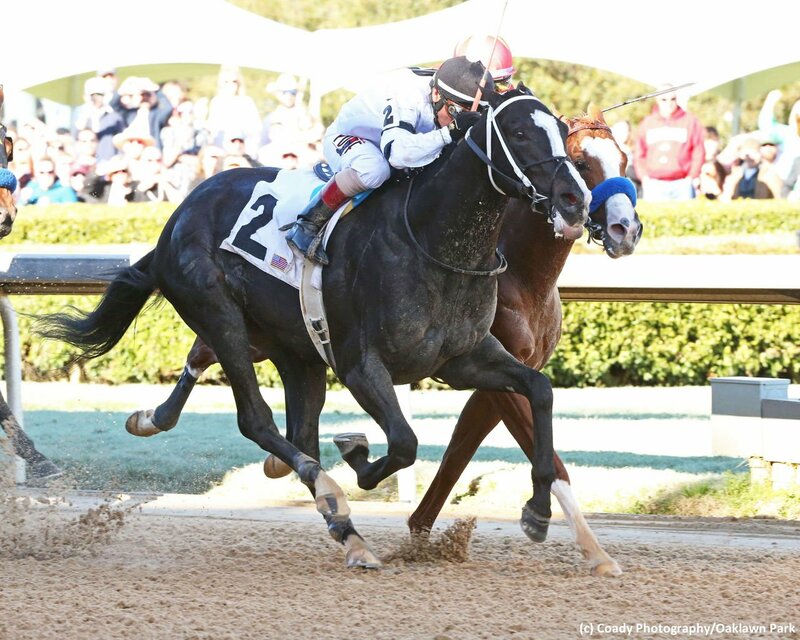 Long Range Toddy’s handlers have him pointed to stay in Oaklawn and run the Arkansas Derby on April 13. Mandella was less certain about Omaha Beach, whose previous races had been at California tracks. “We’ll just have to play it by ear,” he told reporters after Saturday’s victory. Mandella did tell Oaklawn he plans to ship the colt back to California this week. While the odds changed drastically for the two Rebel winners, handicappers remained bullish on Baffert’s two horses. Game Winner remained the 4-1 favorite at William Hill and the 11-4 first choice at Sportsbook.ag. Improbable’s odds moved slightly, with William Hill bumping him to 6-1 from 5-1 and Sportsbook.ag raising him to 21-4 from 5-1. Jody Demling, a Louisville-based handicapper for Sportsline.com, noted Game Winner and Improbable didn’t have the most ideal conditions to prepare for their races due to the unexpected closure at Santa Anita in California. Other Derby contenders who saw their odds change included Instagrand and War of Will, who both went from 8-1 to 7-1 at William Hill. Roadster — another Baffert colt who has yet to run in a major prep race this year — is now at 12-1 at William Hill, who had him previously at 14-1. A couple of horses who lost in the first division of the Rebel saw their odds go up at William Hill. Galilean moved from 14-1 to 35-1 after his third-place finish Saturday, and Extra Hope, who was at 50-1, is now at 75-1 after fading to fourth.